Following a surprise win in the formerly safe Labor seat of Oxley at the March 1996 Federal election (where she attracted a nation-high swing to her of 19.3%), Pauline Hanson and her divisive views drew more approval and voter support (and at least as much criticism) from her Queensland base than from anywhere else in the country. This endorsement applied to both Hanson personally and her One Nation Party, which she founded and then launched – along with new cohorts David Ettridge and David Oldfield – in March and April of 1997. In the interim, she delivered a stinging rebuke to the political status quo in her September 1996 maiden speech to parliament, that expanded on themes in an earlier letter to Ipswich’s Queensland Times, which led to her dis-endorsement by the federal Liberal Party. Her views, however, apparently echoed the sentiments of many, particularly in regional Queensland where rising unemployment and loss of services were attributed to unchecked globalisation and the 'economic rationalism' of the major political parties – including the National Party, erstwhile defenders of those ‘in the bush’. In this atmosphere of regional neglect and general alienation from the political process, the perceived perils of ‘rampant’ Asian immigration and ‘discriminatory’ government largesse to Aborigines provided ready-made scapegoats to those looking for someone or something to blame for their troubles. 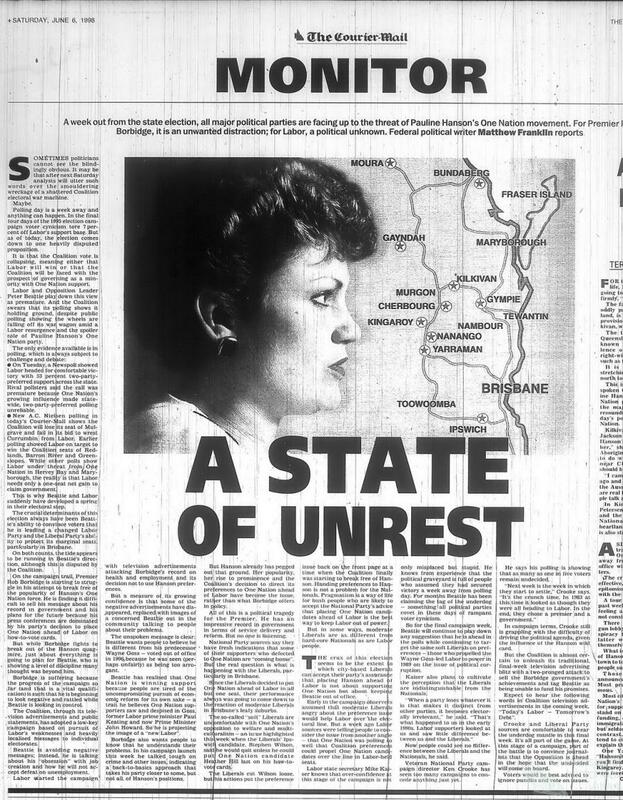 Such notions proved rich fodder for a vocal support movement that sprang up around the independent Member for Oxley, drawing its membership primarily from the Ipswich area of her electorate and the ‘retiree haven’ of Hervey Bay and surrounds. 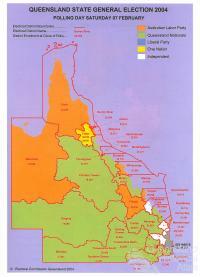 From the time of the party’s inception until its eventual decline, it was these and other regional centres across Queensland that provided the majority of Hanson’s supporters – in nearly every instance twice as many as was the case nationally. In pre-election polling, those who voiced support for One Nation tended to be middle-aged, blue-collar (or no longer working) males of Anglo-Celtic background and with below average education levels. This profile is typical of many of the inhabitants of inland/rural Queensland and of most sizeable centres up the length of the state’s coastline. It was to these and similarly-minded people that Hanson’s populist, rallying call to an ‘emasculated’ and ‘marginalised’ mainstream appealed so strongly. 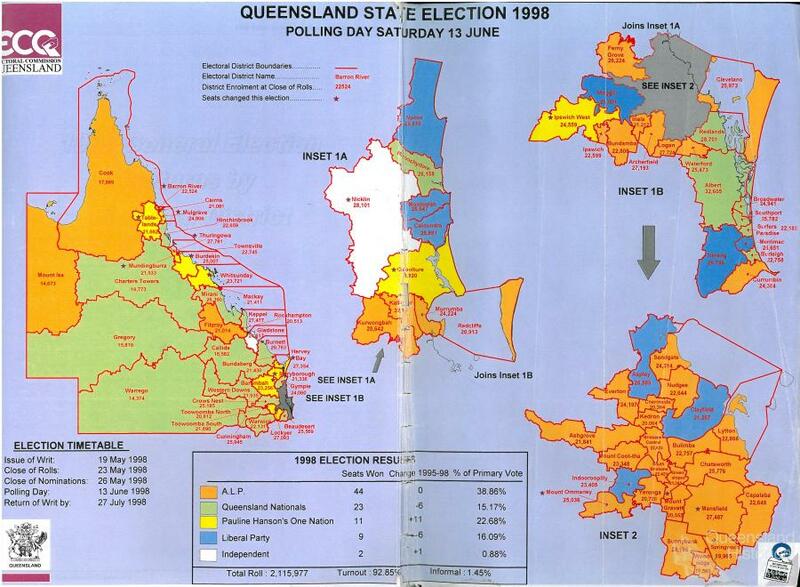 It looked increasingly obvious as the 1998 State poll approached that One Nation had invaded the National Party’s heartland, and furthermore might win over a significant slice of the Coalition’s voter share. If 1996 was a repudiation of the Hawke-Keating era of greater ‘engagement’ with our Asian neighbours, then 1998 would become a trial for the conservative parties’ ability to placate an electorate evidently uneasy with the rapid pace of global economic change. It was this anxiety and a growing disdain for the slick machine of modern politics (as well as a voracious national media) that propelled first Pauline Hanson and then the One Nation Party to centre-stage in this election year. 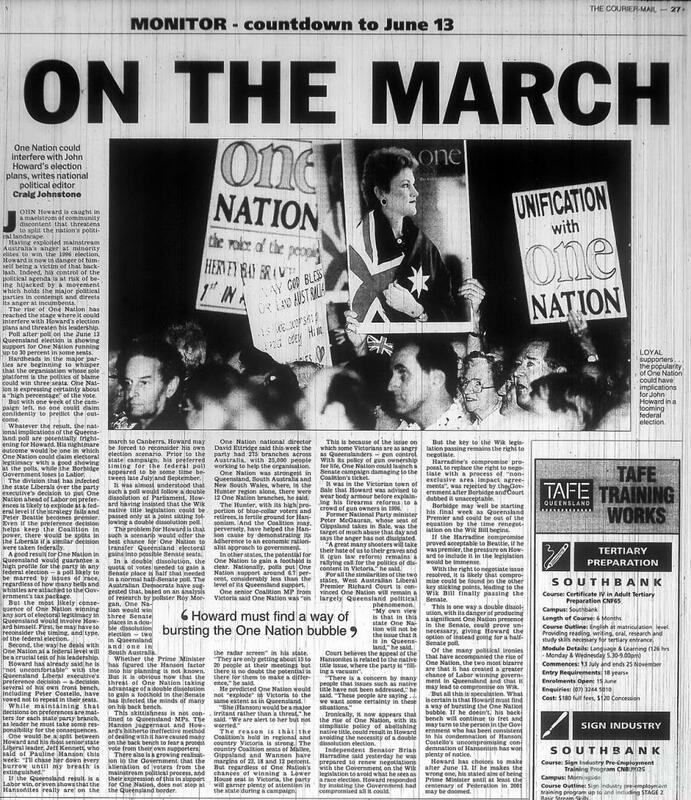 The first outlet for this voter discontent – and the first real test of One Nation’s electoral credentials – came at the Queensland general election on 13 June 1998. 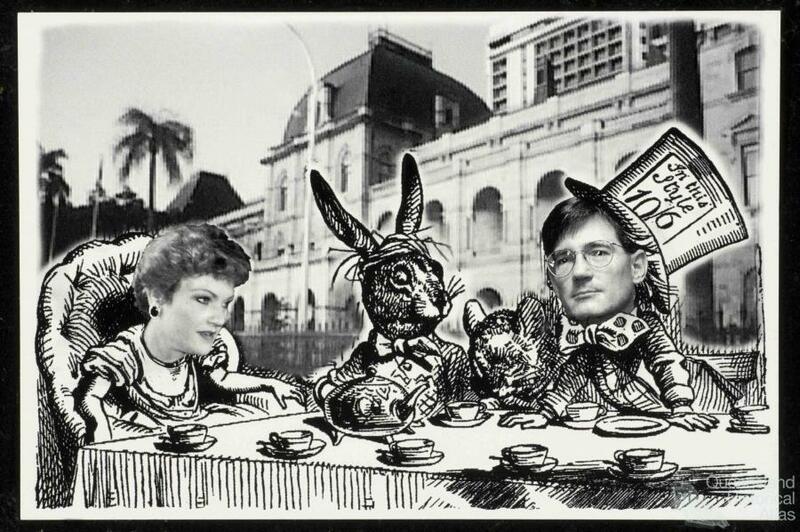 Even before the polling date, Hanson and her new party had drastically altered the political landscape in the state and across the nation, by virtue of the ways in which each of the major parties dealt with this unexpected challenge to their political primacy. It has been well documented how Prime Minister John Howard adopted a ‘softly, softly’ approach – initially, at least – to Hanson’s rise in popularity, whereas Labor under Kim Beazley (and Peter Beattie at the State level) voiced strident opposition to Hanson’s views and the policy platform of One Nation. Labor’s early decision to preference One Nation candidates last in the state election gave it something of a moral high-ground over its Coalition opponents, whose prevarication over this thorny issue left the incumbent Borbidge government at odds with Federal colleagues and looking decidedly opportunistic. 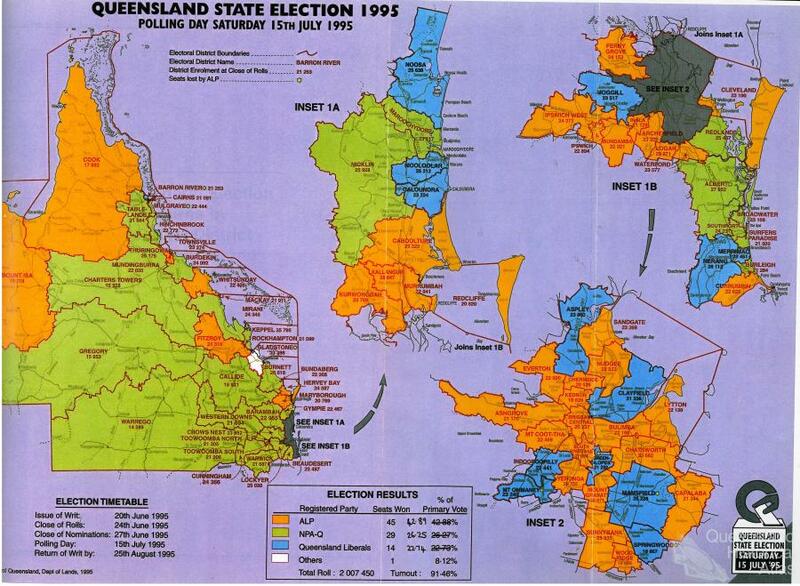 Despite predictions to the contrary, One Nation’s showing in the 1998 state election was quite astonishing, and signified a seismic shift in the character of Queensland politics. At the first time of asking, the party captured nearly a quarter (22.7%) of the statewide primary vote and won 11 of the 79 seats it contested (out of a total of 89). Tellingly, it assumed the mantle of third political force in the State, outpolling each of the Coalition parties (the Liberals attracting 16.1% of the primary vote, the Nationals 15.2%); its parliamentary representation even outnumbered the floundering Liberal Party – punished particularly hard in the State capital for its preference deals with One Nation – which could win only 9 seats (a loss of 6 seats and all to Labor, 4 of these in Brisbane electorates). As a debut performance, it was hard to top – in the normally consistent and almost predictable annals of Queensland’s political history, one would have to look back as far as 1957 to the infamous ‘ALP split’, where the new Queensland Labor Party won 11 seats with 23.4% of the vote as Frank Nicklin led the Country Party to victory. 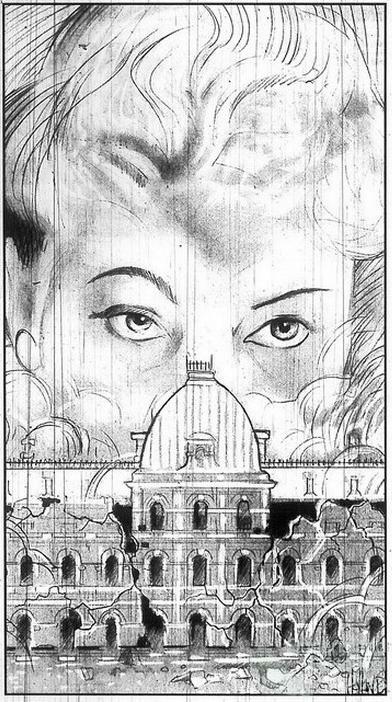 But whereas the QLP drew its support from an already-established Labor-voting base, One Nation cleaved voters away from all of the major parties (although especially the Coalition) in fashioning an entirely new political entity with a supporter base as varied as it was fed up with the alternatives. Despite this indefinable nature, however, the party’s electoral support was clearly regional in character and determined to upstage the major players on the local political scene. That it did so while flying in the face of an equally vocal popular and media backlash, and by largely riding to victory in its 11 seats on the back of Coalition preferences, only added insult to injury for the shell-shocked major parties. Perhaps nowhere was this more the case than in the ‘blue ribbon’ National seat of Barambah, centred around the towns of Kingaroy and Nanango, where Joh Bjelke-Petersen had once been the sitting member for 40 years. 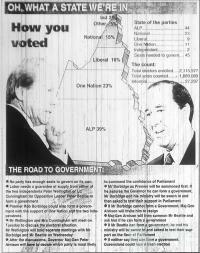 Held safely by Trevor Perrett, a Minister in the Borbidge government (who had been elected to the seat as a Citizens Electoral Council candidate in 1988), the seat was won convincingly by One Nation’s Dorothy Pratt, who polled 43.5% of the primary vote – the best result for any One Nation candidate in the entire State. 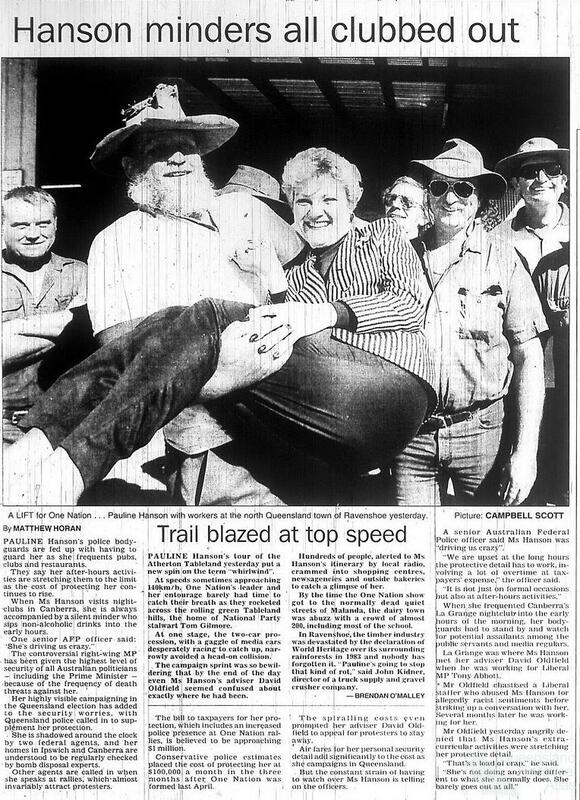 Ms Pratt represented her electorate so effectively that she has won the seat – renamed Nanango from 2001 – at every election since then (albeit as an Independent after resigning from the One Nation Party in February 1999). 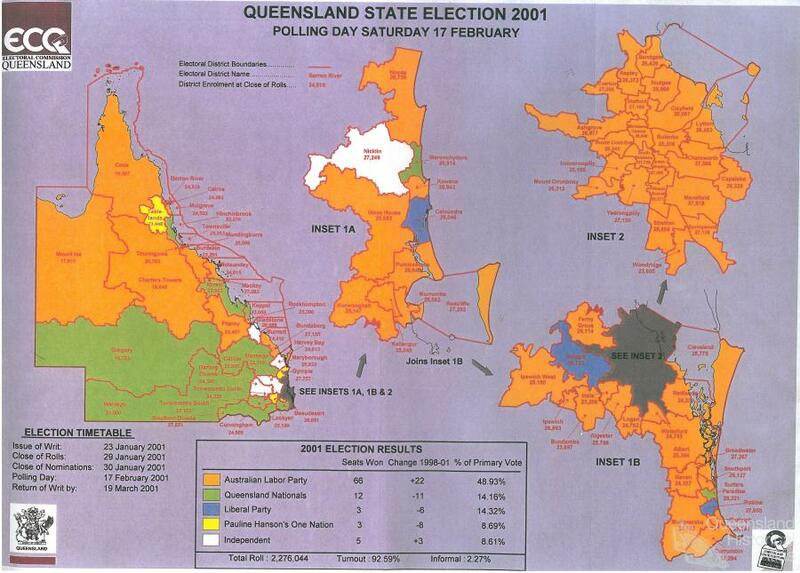 It was a story repeated across the state, with a pattern emerging indicating that One Nation, while out of favour in Brisbane and the urban core of other major centres, was very much in favour nearly everywhere else. Besides Barambah, the party won Burdekin (with 33.1% of the primary vote), Caboolture (29.9%), Hervey Bay (33.8%), Ipswich West (38.6%), Lockyer (39.2%), Maryborough (42.6%), Mulgrave (31%), Tablelands (42%), Thuringowa (34.9%) and Whitsunday (30.7%). Six of these seats were prised from Labor’s grasp in outer metropolitan or urban/rural fringe districts, while five were won from the Nationals in typically rural areas. There were many near misses, too; in several contested seats the party attracted a sizeable primary vote – sometimes more than all other candidates. The highest profile of these was Ipswich, where the party’s state leader, Heather Hill, polled 39.5% but lost to Labor’s David Hamill. Similar results unfolded in the seats of Bundamba (34.3%), Burnett (36.4%), Callide (37.5%), Crow’s Nest (39.5%), Gympie (39.2%) and Western Downs (34.5%). 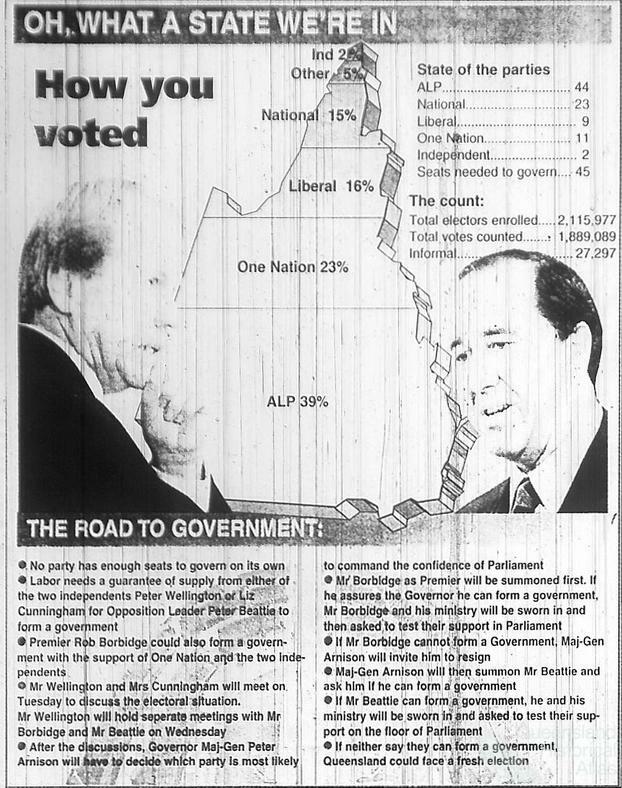 It is clear from these figures that One Nation’s electoral support had expanded outwards – spectacularly so – from its Ipswich origins. 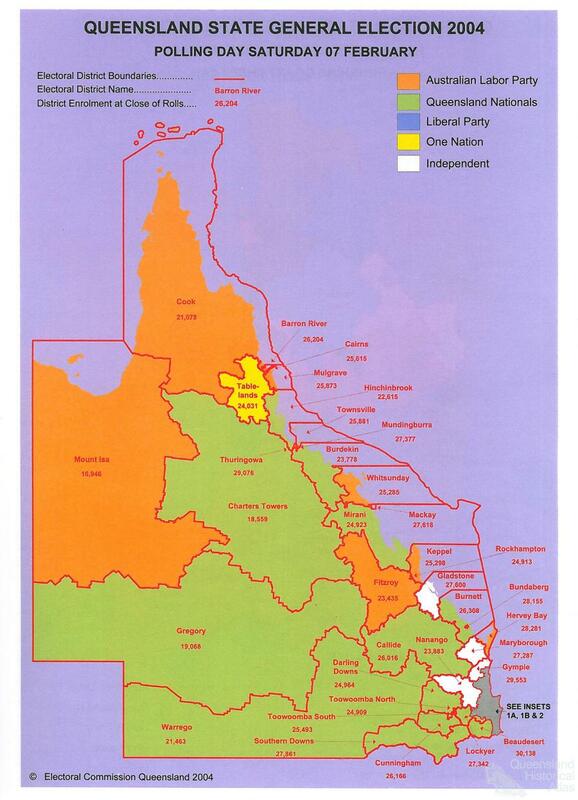 In the election wash-up, the party laid claim to a lengthy, almost unbroken stretch of coastal territory in far north Queensland reaching from north of Cairns to Mackay, and was a mere handful of votes away from encircling the entire south-east corner of the state. 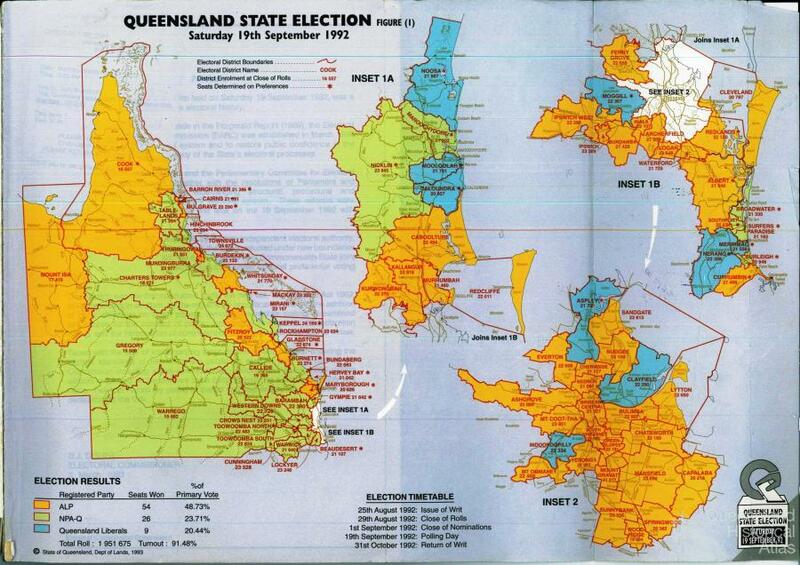 Also clear to the rest of the country was that, with a Federal poll due later in the same year, a potent, alternative and (significantly) home-grown political force had well and truly landed in Queensland.